Picture Copyright Carsten Anderson of COASTER-net.com, used with permission. After 11 years, Millennium Force is finally being repainted. It currently looks like the lift and queue line area of track has been painted so far. Hopefully the whole ride will be sporting a new coat of paint by Opening Day. I would like thank Carsten Anderson of COASTER-net.com who allowed us to use his pictures. Thanks to the help of my friend, Christopher Huges (@chriswc11), I stumbled upon the 2011 park map. It’s not the full map as it takes up half a page in the school group brochure, but it gives you an idea of what the map and park will be like next year. Starting off at Cedar Point’s new ride WindSeeker we find the the Beach Entrance is going to be placed on an angle and it looks like WindSeeker’s queue line will start by the Extrema Sports Stadium as shown in the animation. We all knew it was coming, it looks like Chaos is leaving and a 3-point challenge is going in it’s spot. As seen in the next image, it looks like the Demon Drop 3-point challenge has vanished from the map. Cedar Point’s other “new” ride for 2011 is Ocean Motion. Moving from it old location where WindSeeker is going to the Demon Drop’s old site. A pond will be placed next to it to add to the theme of the ride. As you can see the 3-point challenge is no longer shown. 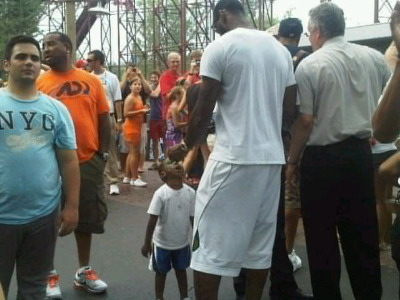 SANDUSKY — No, LeBron James and Miley Cyrus weren’t at Cedar Point together but both paid a visit to the amusement park in the last three days and we have the photos to show you. 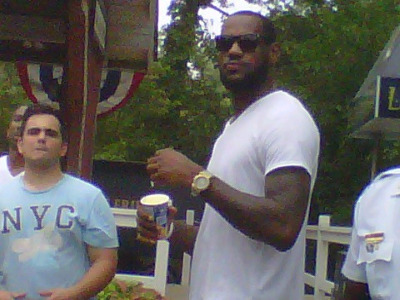 Cyrus took a break from work and enjoyed some fun with friends on the Millennium Force roller coaster on Saturday afternoon. 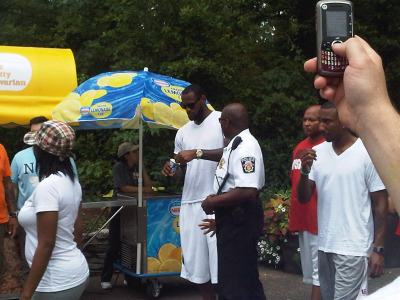 On Monday, LeBron James seemed content at first to keep his feet on the ground as he strolled through the park, eating a frozen lemonade cup and sharing it with one of his sons. 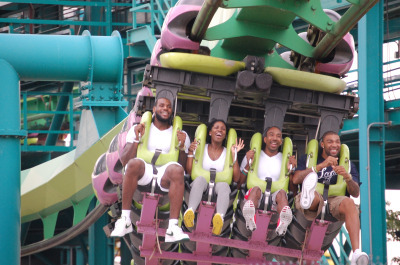 Then he took to the air later in the day, riding the Raptor with pals from Akron, including Dru Joyce.